A great meal on a slow weekend or during a family get together. 1. Blanch the noodles in boiling hot water and keep aside for 15 minutes. 2. Mix the orange juice, orange zest, red curry paste, fish sauce, sugar and 1/4 to 1/3 cup of water. 5. Add half the ginger and garlic. 7. Add the capsicum and stir-fry for 4 to 5 minutes. 8. Add the beansprouts, prawns and cook until prawns turn pink. 9. Drain the noodles and add to the pan. 10. Add the coriander leaves, basil leaves and remaining ginger. 11. Add the sauce and stir well until the noodles are evenly coated. 12. Remove, garnish and serve. 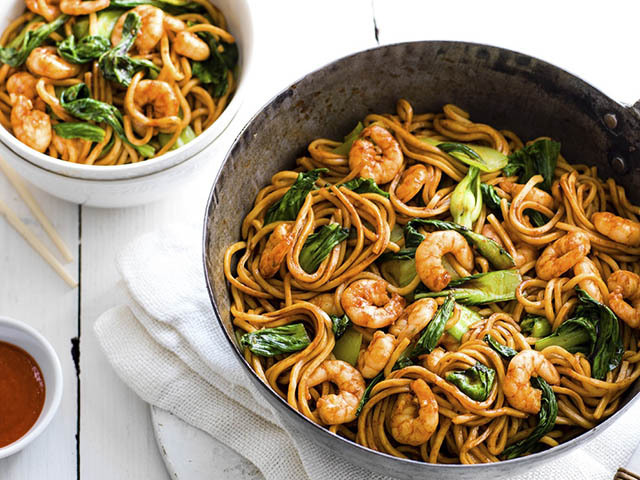 Feel free to comment or share your thoughts on this Thai Prawn and Ginger Noodles Recipe from Awesome Cuisine.